Oriental, Persian and Turkish rugs often mean much more to their owners than serving as an addition to their home or work décor. Apart from being an investment in a work of art, each rug tells a unique story of the artist who created it, the place where it originated and the quality of its workmanship – the latter being directly related to its materials and technique. Machine-made rugs bear none of these indicators, with the exclusion of materials, which will be covered later. Today, we will examine the importance of each of these areas in determining the top 3 reasons for choosing a handmade rug over one produced by a machine. The decision is one that should not be taken lightly, particularly if you’re someone who wants more than a decorative accessory. 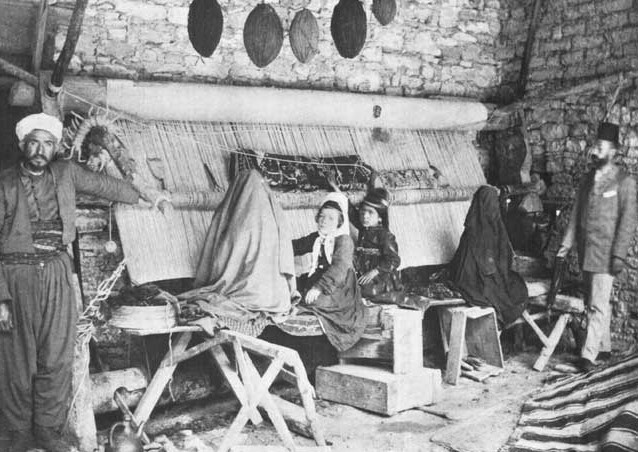 As the name implies, machine-made rugs are produced in factories, often on complex looms which are run solely by computers or a mixture of both human and automated labor. These carpets’ designs are typically programmed onto the machine’s software and then mass produced in a hasty manufacturing process that ensures a higher profitability for the business. Handmade Oriental rugs, on the other hand, are produced by an artist who is either a first generation weaver or comes from a long line of craftsmen and women who pass the skill down through ancestral or artisanal relationships. Because of this, rugs and tapestries frequently feature designs that are a continuation of motifs and storylines which have been translated over several generations, with each one making improvements on the last. Oriental, Persian and Turkish rugs produced by hand, however, are beautifully intertwined with the location where they were woven. Whether your carpet was handmade by a single weaver on the outskirts of Sultanabad, Pakistan, constructed by a family of artisans in India, or finely composed by hand in the Savonnerie workshop, your rug’s origin is distinctly attached to both its artist and story. One of the reasons people choose handmade rugs over machine-made rugs is for their slight imperfections. Even the most skilled weavers make minor mistakes during the creation process; but like any great painting or sculpture, these tiny imperfections only serve to promote the unbreakable connection between an artist and their work. Beyond this, these types of rugs also exhibit a sinuous appeal as a consequence of being woven by hand and because of a weaver's insistence on using only the best materials available for the finished piece. In essence, it is because of their love for the artistry itself that we, as Oriental rug appreciators and owners, have found such a profound interest in their craft. If you live in the NYC Tri-State area, come into our showroom to explore the beauty of handmade rugs for yourself. Live outside of New York? Contact us online, or visit our rug shop to learn more about these stunning investments and works of art.